A “passive” house achieves overall energy savings of 60-75% and 90% of space heating without applying expensive “active” technologies like photovoltaics or solar thermal hot water systems. Energy losses are minimized, and gains are maximized. Superinsulation and air-tight construction minimize losses. The heat/energy recovery ventilator helps keep energy that has already been generated in the house instead of venting it out. In climates like Ireland with low humidity and high day/night temperature differentials, it can be very effective to bring in outside air through a pre-warming/cooling “Earth Tube” to passively harvest the energy of the earth (without use of active ground source heat pumps). It is beneficial to install solar hot water systems in addition to the passive house construction techniques. Next to space heating/cooling, domestic hot water is the biggest energy requirement in a home. Solar hot water can also be used effectively to provide the remaining space heat wherever heating is necessary (hydronic heat coil integrated in supply air of the ventilation system). Isn’t the standard an unreasonable constraint on the freedom, expression and aesthetics that an architect has at his/her disposal? As designers who are very familiar with the Passive House principles and how to use the Passive House Planning Package software as a design tool, we will be able to do (almost) anything as regards aesthetics. The core principle for us is to develop varying solutions based on the specific boundary conditions of the object to be designed. The Passive House standard is redefining the boundaries of the building sector. People now desire homes that allow them to be energy independent and that are ideally carbon-neutral. We view the Passive House standard as an opportunity rather than a limitation. It opens a multitude of doors to reshape aesthetics and expression for the needs of this 21st century. It’s common building wisdom that a house needs to “breathe.” Can the Passive House’s air-tight construction lead to moisture or air quality problems? Many new homes today are being built tightly in an improper fashion, trapping moisture inside and leading to significant mold and indoor air quality problems. Unlike most other new construction, the Passive House employs an appropriate vapor barrier and then a mechanical, balanced ventilation system with heat recovery, which assures superior air-quality and comfort by continually exchanging the indoor air. Moisture is safely removed, as well as other potentially unhealthy pollutants (for example off-gassing from carpets or furniture). Also, people with allergies can easily control the indoor air-quality by specifying filters according to their particular medical needs. 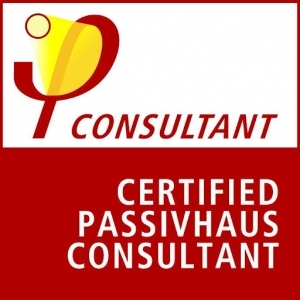 How does the cost of Passive House construction compare to that of standard building? Achieving the Passive House standard requires an additional upfront investment of approximately 8-10% of the construction budget, as compared to regular building regulation standard construction. However the real savings occur over the life-time cost of running the home. Can you open the windows of a Passive House? Yes. You can open windows and live in a Passive House just like in any other house. It is a normal house. You have the tools to do just what you would do in any other house: if it is cold outside, instead of sending the warm air directly outside through opening your windows, one can use the ventilator to do the ventilation, keeping the heat inside the house. During the inbetween seasons one can bring in fresh air through windows like in any other house, and even turn off the ventilator if so desired. If it is hot outside, it’s best to keep the hot air outside and the cold air generated through active cooling or night cooling in. The ventilator then recovers the cold air for you and you still are able to properly ventilate your home. Note that studies have shown that most people do not ventilate their home as they should. The desired humidity inside a home should be between 30-60%. If it is lower than 30% most people perceive it as uncomfortable to breathe. If it is above 60% mold growth will be supported and is very likely. Regular home owners should open their windows every two hours for two minutes to ventilate properly (including night hours). The Passive House provides proper ventilation continuously, at low speeds and free of dust; creating a superior, healthy indoor air quality.